Heads up, Harry Potter fans! It’s not only a trip to London or to the Wizarding World of Harry Potter in Orlando that brings you close to J.K. Rowlings enchanting novels. Edinburgh offers quite a number of magical hotspot as well! Did you know that both the beginning and the ending of the Harry Potter novels originate from the Scottish capital? No other place will get you as close to the authentic and original world of Harry Potter as Edinburgh does! The place where it all begann: At Elephant House, a café in Edinburgh’s old town, J.K. Rowling worked on “Harry Potter and the Sorcerer’s Stone”. 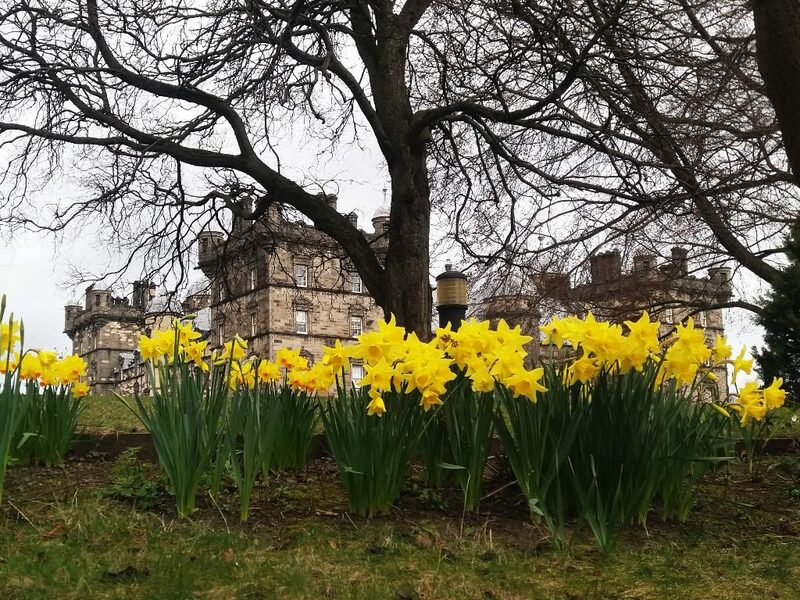 The view on Edinburgh Castle and an adjacent graveyard is not only beautiful to look at but moreover helped Rowling with the creation of her magical world. Nowadays, the café’s walls are covered with newspaper articles about the famous author. Even writer Ian Rankin was a guest in the pretty and comfortable café. 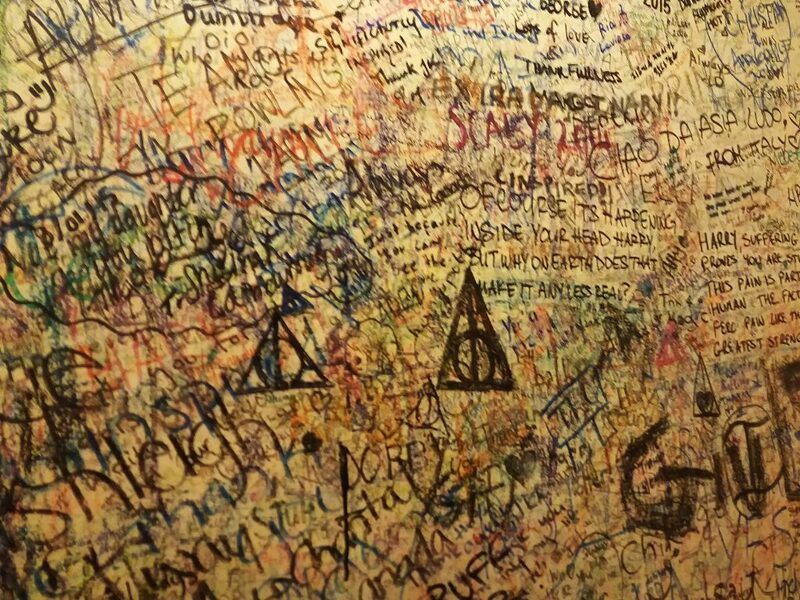 But the true highlight are the restrooms, the walls of which are are covered with declarations of love and expressions of thanks to the fictional characters or their creator from top to bottom. And fans still find small, empty spots to leave their personal message behind. 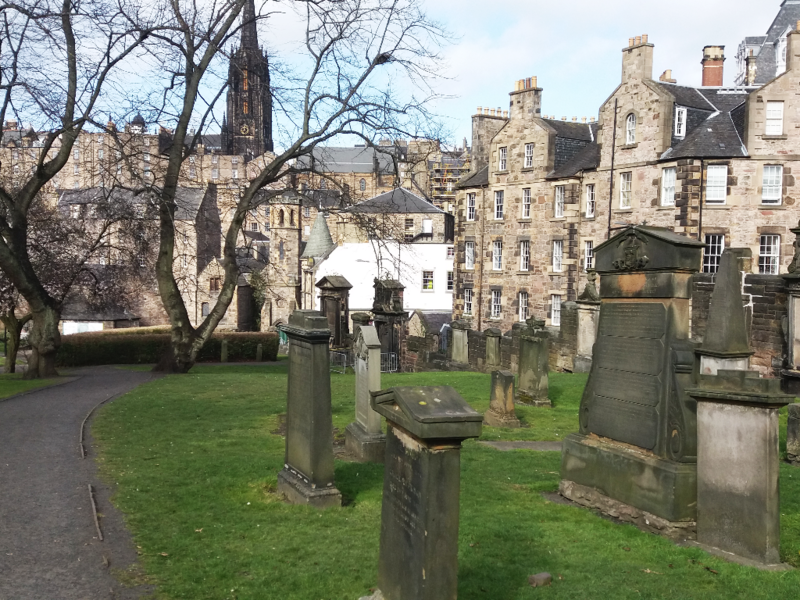 Greyfriar’s Kirkyard, which is only a few steps away from Elephant House, it’s truly eerie and atmospheric and furthermore attracts a huge number of Harry Potter fans. The graveyard is home to tombstones, the names on which should sound familiar to Harry Potter fans. The tombstone of Thomas Riddell is said to have served as J.K. Rowling’s inspiration for Lord Voldemort and even the names of McGonagall and Moony can be found here. Furthermore, the graveyard reminds of the one Harry and Cedric are brough to via port key in “Harry Potter and the Goblet of Fire”. 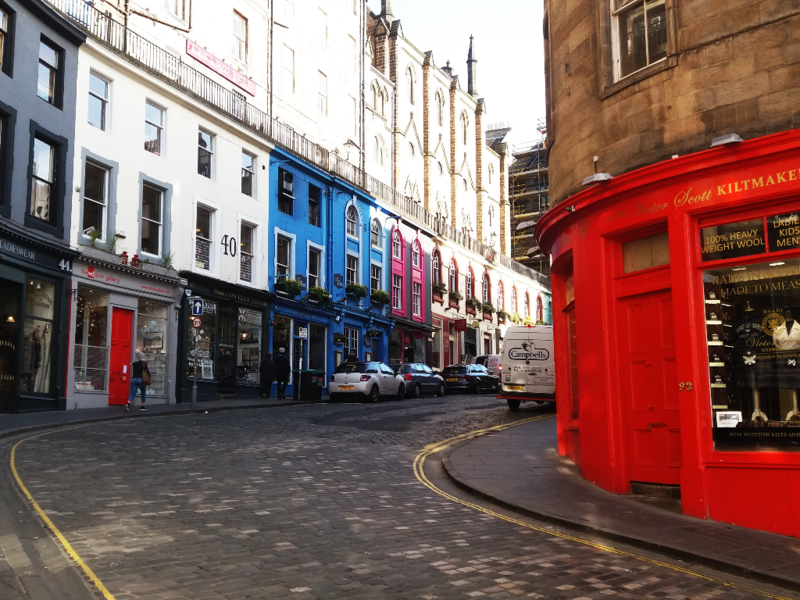 Victoria Street, which is located in close proximity to Greyfriar’s Kirkyard and Elephant Café, is a beautiful and colorful street. It is moreover considered to be J.K. Rowling’s inspiration for Diagon Alley, the shopping street that is popular among witches and wizards. Some of the stores on Victoria Street take this up and offer various kinds of souvenirs and merchandise of the wizardry world. Apart from miniature editions of Hogwarts Express, chocolate frogs and dragon blood are waiting for Harry Potter fans. George Heriot’s School founded in 1628 is one of Edinburgh’s most reputable schools. It can be seen from the window front of Elephant Café and with its four towers, it reminds of Hogwards and its four houses Gryffindor, Syltherin, Ravenclaw and Hufflepuff. To me, it seemed as if Hogwards was the perfect fusion of George Heriot’s School and Edinburgh Castle situated on one of Edinburgh’s volcanic hills. The Harry Potter novels do not simply have their roots in Edinburgh but were finished here as well. 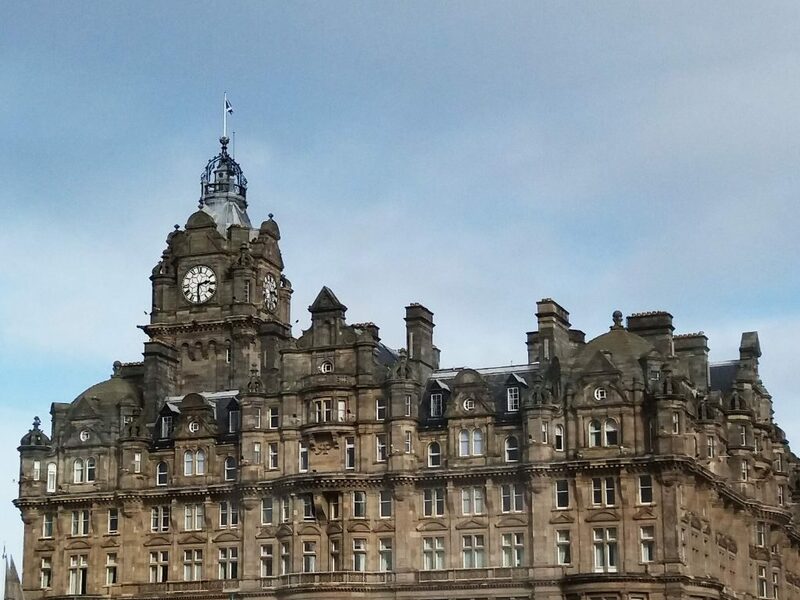 J.K. Rowling worked on the last parts of “Harry Potter and the Deathly Hallows” in a room in the luxurious Balmoral Hotel in Edinburgh’s New Town. Fans can now rent the exact room, in which Rowling resided. Unfortunately, one night in this room is almost unaffordable. That’s for sure: You won’t get closer to the roots of the magical world of Harry Potter than you will in Edinburgh.